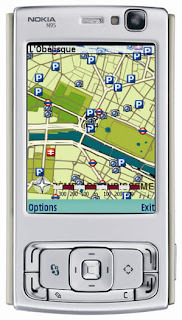 The Global Positioning System (better known by its acronym GPS) sees a meteoric rise to popularity on mobile phones. According to a survey 24% of all Americans want GPS as a feature on their next phone, and they seem to be served: nearly every large OEM offers the feature in their higher-end models already and others rack up to get there (Nokia N95, HTC Touch, Blackberry 8800, to name a few). And - no buzz without the iPhone these days - there is rumour that one of the GPS leaders, TomTom, is developing the respective module for the iPhone. As the feature shows appeal to a very wide demographic, this might become a feature like the camera today: initially dissed ("who needs a camera in his phone? "), camera phones are the overwhelming standard today and are putting ever-increasing pressure on digital cameras (well, OK, probably not the high-end SLR but otherwise). This is not entirely surprising: one does not normally turn to one's phone when feeling the urge for a movie but it provides true value-add when you walk through the streets of an unknown city (or unknown district of your home town) looking for the right street, and you can actually turn to your phone's GPS function. GPS of course provides a completely new take to the holy grail of mobile services, namely LBS (or: location-based services), too. I prefer the term location-aware as such offerings need not necessarily be "based" on this. Way beyond simple "sat nav", everything from dining out, clubbing, flirting, and generally looking for like-minded people in a given environment would be greatly enhanced by such features. Not to mention marketeers of retailers and consumer brands who are surely already drooling on the thought of what they could do when they could lure consumers into their shops with tailor-made offers just when they walk past their shops. ZagMe was a bit too early for this, it seems but then this was pre-GPS. Brave new world?